Emed > News > Could Genetically Modified Mosquitoes be at the Root of the Zika Crisis? Could Genetically Modified Mosquitoes be at the Root of the Zika Crisis? Cases of the Zika virus, first discovered in the 1950’s, have alarmingly escalated recently in South and Central America resulting in birth defects and other serious health issues. The virus is transmitted by the Aedes aegypti mosquito; a mosquito species endemic to Latin America. There are fears the disease is only weeks away from also being carried by the much more common culex mosquito, found in most parts of the Americas, Africa and Asia. The humidity, heavy rains and in some areas poor sanitation found in this region provide ideal conditions for mosquitoes to thrive. Ordinarily symptoms of the Zika virus include mild headaches, maculopapular rash, fever, malaise, conjunctivitis, and joint pains. Within a matter of days the rash fades and the fever resolves. One in five infected people develop symptoms and there have been no recorded fatalities. The current Zika virus outbreak was first reported in May 2015 in Brazil with up to 1.5 million people affected and health experts contend that four million people could be infected in the next year. Senior health experts fear that the Zika virus, which has now been confirmed in 23 countries, could be a bigger threat to international health than the Ebola epidemic that killed more than 11,000 people in Africa in 2014. The Zika virus is undoubtedly a global health crisis. Something has now changed but why? In an effort to explain this health crisis, many people have pointed to the release of genetically modified mosquitoes in 2012 in exactly the same area of the Zika outbreak epicentre. 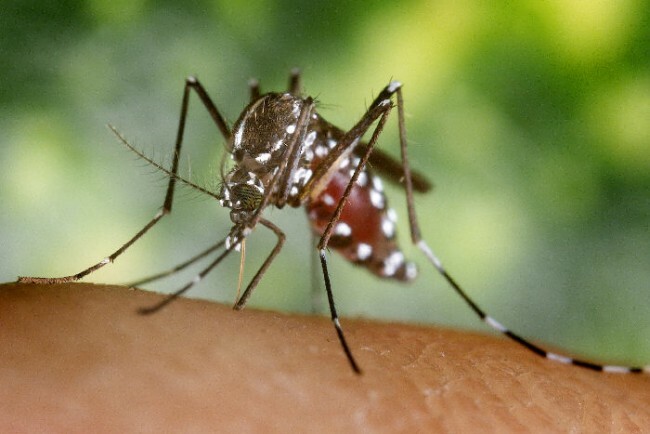 In mid-2012, British biotechnology company Oxitec released genetically modified mosquitoes with the aim of reducing the overall mosquito population that spreads dengue fever, the Zika virus, and chikungunya into the general population in northeast Brazil. The Aedes aegypti mosquito sub-species that carries both the Zika virus and dengue fever is the very type Oxitec targeted with its genetically modified mosquitoes. The aim of Oxitec was to release only male Aedes mosquitoes into the wild and they would in turn produce offspring with their virus carrying female counterparts. This offspring would then die off before breeding age due to the genetic coding in their genes as long as the antibiotic tetracycline wasn’t present, which would override the genetically modified DNA. There is already a known survival rate of up to five percent in these genetically modified mosquitoes regardless of the presence of tetracycline. Some research indicates that the genetically modified mosquitoes survival rate could potentially increase to 15 percent. Tetracycline often prescribed to treat teenage acne, can be also found in nature including soil, surface water and food. Could this become an avenue of antibiotic resistance? Notes Jaydee Hanson, a senior policy analyst at the US-based Center for Food Safety, to Bloomberg News “Mosquitoes are food for lots of animals. Could this become an additional way Zika virus is introduced or mutated – via the food chain? In 2012 experts expressed concerns about the program at the time of its inception, arguing that further studies were needed on the potential consequences. “It’s a very experimental approach which has not yet been successful and may cause more harm than good,” Dr Helen Wallace, director of GeneWatch, told the Guardian newspaper back in 2012. The project was not successful. The critics of the project should have been listened to. We have all been confronted with heartbreaking and disturbing images of the most devastating impact of the Zika virus – babies born with microcephaly – a condition that leaves children with tiny heads. This results in incurable brain damage in many cases. Since the outbreak, there have been over 4,000 cases of babies born with microcephaly in Brazil. Microcephaly can be triggered during pregnancy with some mothers stating they had a high fever around the fourth month of the pregnancy. However most virus carriers are symptomless, making the Zika virus even more insidious. The prognosis for children born with microcephaly is mixed and is dependant on the severity of the condition. However on the other side of the spectrum, there may be developmental problems, intellectual disabilities (mental retardation), delayed speech and motor functions, vision and hearing problems, dwarfism or short stature, seizures, or other problems associated with brain abnormalities. Their lifespan may also be shortened due to the condition. Children with microcephaly can benefit from early intervention programs with physical, occupational, and speech therapists to help them reach their full potential and enhance their quality of life. Given that economic advantage may be lacking in some affected areas in Central and South America, these important therapies may not be available. If Oxitec were to be found responsible for this microcephaly, they should be morally obliged to assist these children and their families to achieve the best quality of life possible. Although there is no definitive proof currently that genetically modified mosquitoes are responsible for both the outbreak of the Zika and the ever increasing numbers of microcephaly in South and Central America, what is evident is that the British biotechnology company Oxitec has behaved extremely recklessly and irresponsibly. The map of north eastern South America provides a damning implication that the genetically modified mosquitoes were released in exactly the same area as the epicentre of the Zika virus outbreak prior to potential consequences being determined. Not only has the virus spread to 23 other South and Central American countries but there are reports of the Zika virus appearing in other countries due to travellers returning home. The World Health Organisation have expressed concern that it could hit Africa and Asia. Two Australians were diagnosed with the virus after returning from the Caribbean, confirming the first cases of the virus in Australia this year. Zika is known to be spread by the bite of mosquitoes of the Aedes genus, and a claim that sexual contact as a mode of transmission is a potentially alarming development as reported in Austin, Texas 3/2/2016. While the finger pointing has begun, we should not lose sight of the devastating human impact on thousands of children and their families and treat this health crisis in the most humanitarian way possible.